LORENZ Life Sciences: eSolutions | LORENZ docuBridge | What's new? 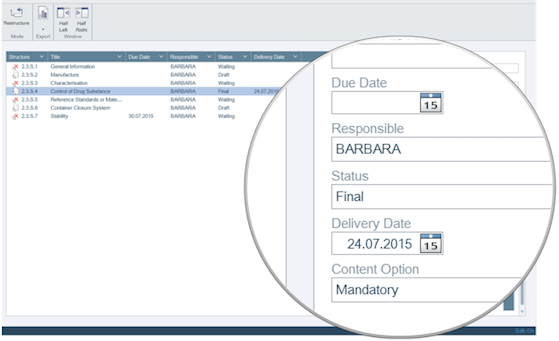 This new module allows you to plan, review & report the content delivery status of a submission using a tabular view and configurable planning attributes. docuBridge now supports full text search across documents, sequences or a complete application life cycle (imported submission) by interfacing with Google Search Appliance (GSA). Need to reference to previously submitted files? Browse through previously published output to easily identify the files that you want to reference to! docuBridge now supports the easy merging of node structures. This enhances the work with Part Submissions and allows imported applications to be easily elevated to a complete application based on a selected Application Template. 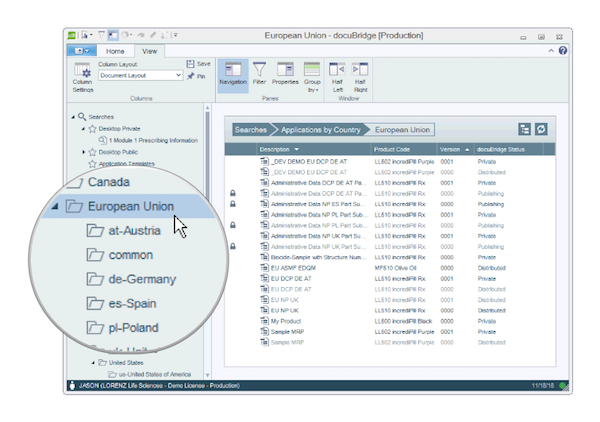 LORENZ docuBridge can be configured so that access all new items and new versions created in the system is given to the appropriate groups. Alternatively, metadata can be used to to set conditions for distribution of items to take place automatically when a certain stage is reached. Contact a LORENZ Service Consultant to find out more. 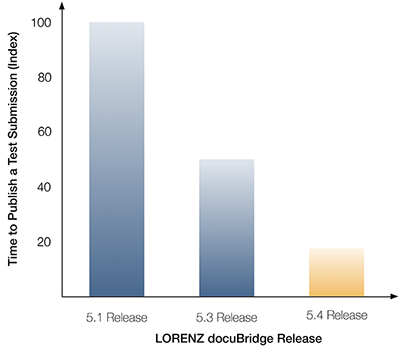 LORENZ docuBridge registers submisson relevant PDF properties such as PDF version, file size, and PDF protection settings, for each node while you compile. You can check each submission easily before publishing to make sure that these settings are submission ready. If you accidentally deleted a node that you should not have, you can restore deleted lifecycle nodes easily regardless of how many sequences ago the node was deleted. Submission Replication replicates the content files, hyperlinks, and node properties set in a source sequence to a lifecycle sequences in target applications. 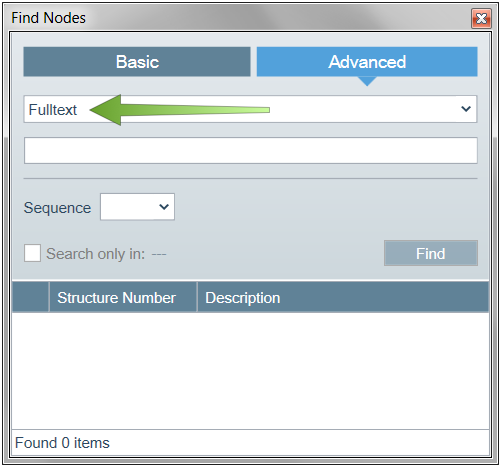 You can easily compare individual nodes in the source and target sequence and open both submissions in side-by-side mode with a single click.You can replicate from the source sequence to the target sequences several times and even change which sequence is the source sequence in a group if this is necessary. 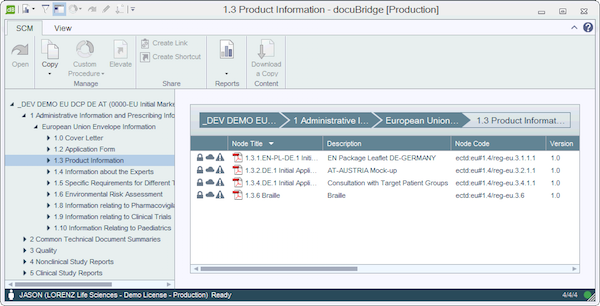 LORENZ docuBridge generates a clearly structured report for each target application with docuBridge links to each node. 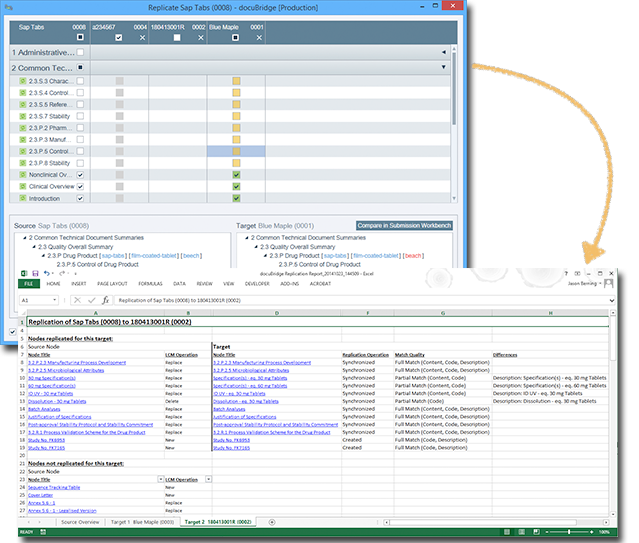 With Application Views in docuBridge you to filter which sequences in an application are displayed using one or more version level custom attributes, e.g. 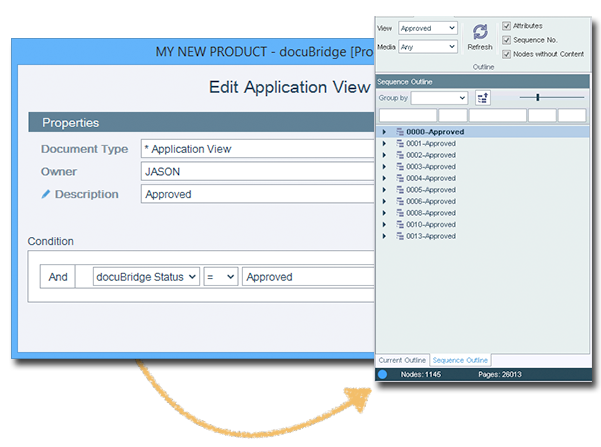 an Application View "Approved" may be defined in that that the docuBridge Status is set to the attribute value "Approved". 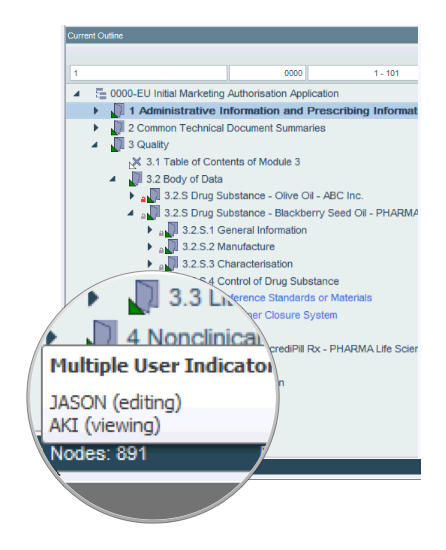 In addition to the custom Application Views, there is a default Application View that shows users who "Edit" or "Publish" all sequences of an application. 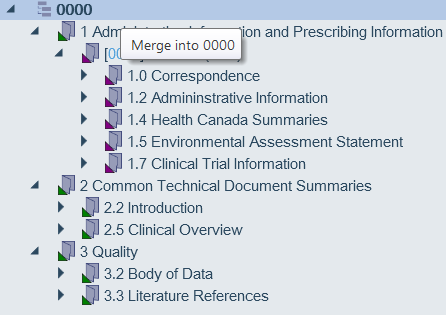 A redesigned Infopanel, now fully integrated into our docuBridge Explorer, provides you with a clearer view of the job queue and allows you to drill-down directly into the validation reports and submission output locations. Pushed for time? Some larger submission can take time to publish. However, you are now able to publish your submissions incrementally. 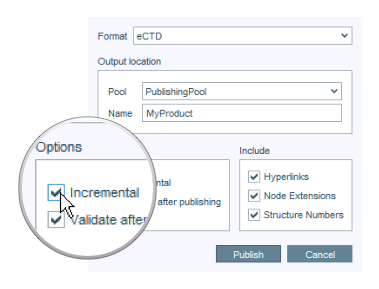 This means that if you have published the same submission earlier, you can now opt to publish - or update - only those items that you changed since your last publishing round. This can save significant time particularly when you are close to a deadline and still need to or want to make last-minute changes. Need to know if you are on the right track while compiling your submissions? 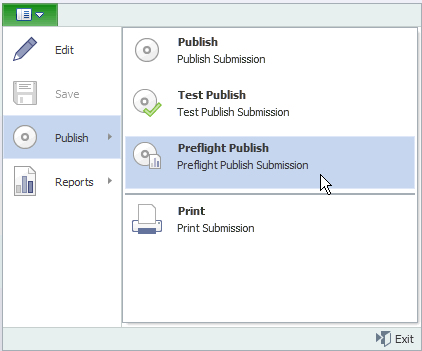 Pre-flight publishing allows you to create an abbreviated eCTD and validate it to make sure your structures, meta-data and other relevant information is up to scratch. This allows to make corrections on-the-fly without having to publish entire submissions. With the latest release we have again significantly increased the speed of the job engines, making them two to three times faster in our test environments. Job engines deal with tasks such as publishing and importing submissions. This will significantly boost your operational efficiency, especially those of you with large submissions! We have also added the capability to license additional job engines for those of you in high production environments. The Dictionary Module (may require additional licensing and/or configuration) allows you to create and use relational attributes for docuBridge, including the definition of dependencies between attributes. For Example, if the attribute "Document Type" is selected for "Literature References", then the attribute "Section" will only show "3.3 Literature References", "4.3 Literature References", etc. 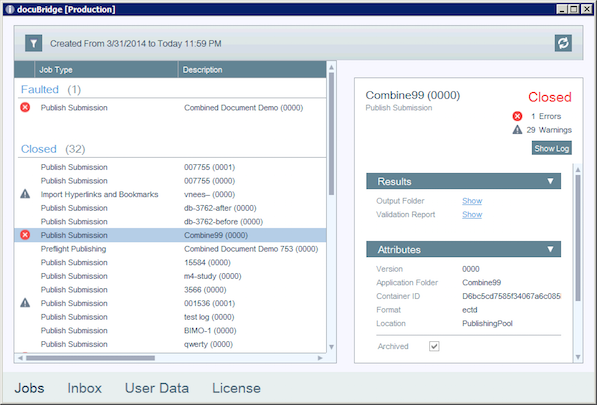 The Submission Content Manager (may require additional licensing) lists all documents in an application sequence. 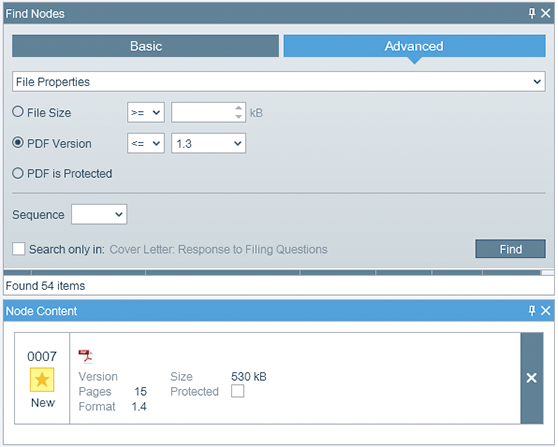 This allows you to perform additional tasks, such as managing document attributes and permissions for an entire set of documents that are related to that submission. 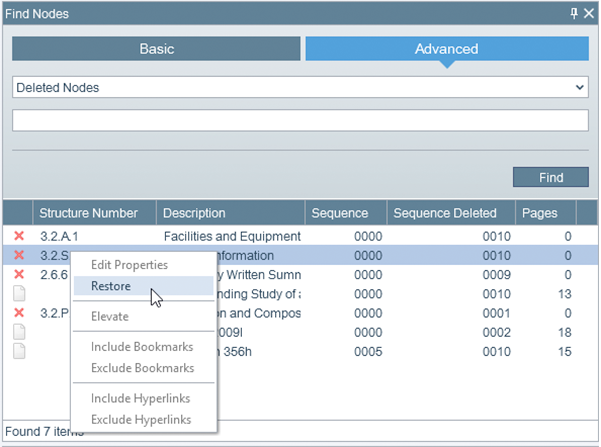 This feature can enable other functionality, such as the ability to import submission sequences and "elevate" the documents found in the submission, move them to a content management system and allow you to continue the life-cycle of the document in itself. This is exceptionally powerful if you are migrating submissions from one system to another (even from one content management system to another), or frequently work on submissions that contain content not created within your own organization. 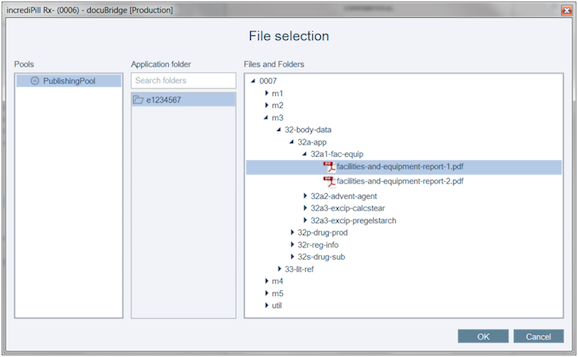 The docuBridge Explorer is your hub to find and locate your submissions based on pre-defined meta-data. Use dynamic filters to locate your submissions based on - for example - projects, countries or a status. Automatically create project folders dynamically to group certain submission types and their content. 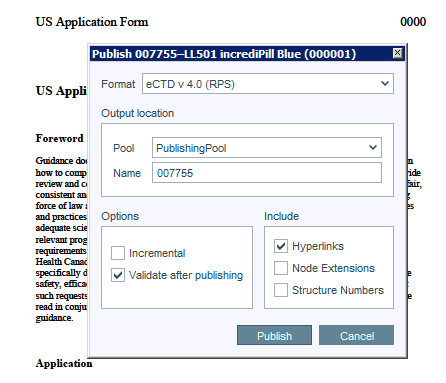 With docuBridge, we have already implemented an Alpha version of RPS Publishing, also known as eCTD 4.0. 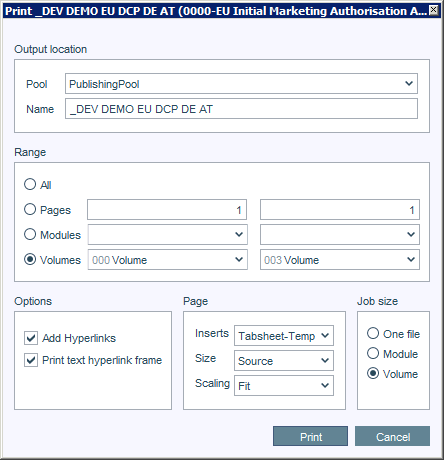 This means that you do not have to worry: you do not have to change systems or learn new processes - the RPS publishing option is simply another publishing module within docuBridge. At LORENZ, we are also a voting member of Health Level Seven (HL7), that develops the RPS standard. If you work in teams you may need to work on a single submission sequence in parallel. docuBridge 5 brings this to you! As soon as you edit a node in the table of contents, docuBridge will immediately lock down that section so others can only view, rather than edit, that same node. The eCTD contains more than just documents - it also transports quite a bit of data. And pending on where you want to submit, this required data changes from region to region. 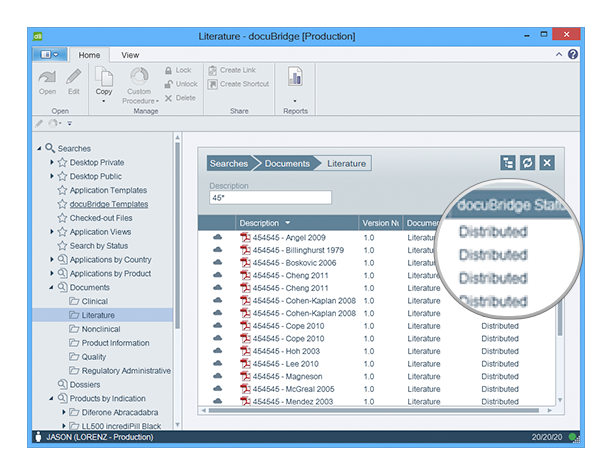 docuBridge 5 has an Administrative Data Editor that easily allows you to edit, manage and re-use information typed in once. This is particularly useful in Europe, where you may be required to submit only slightly differing data to the various countries for certain submission procedures. The ICH eCTD specifications specifically highlight that the eCTD was not designed as a transport mechanism between industry. It's role is purely to submit the required information to the agencies. But what if you work with multiple partners, CROs, or plan to license a submission and need more than what is in the submission itself? 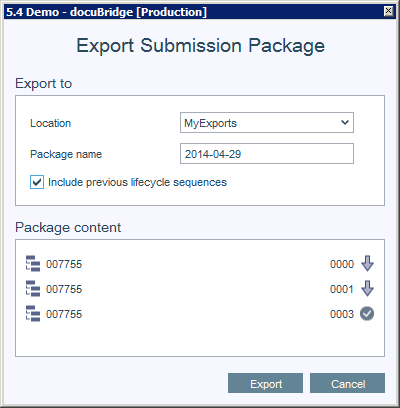 Users of docuBridge 5 can make use of the Submission Exchange feature. Rather than focusing only on the submission and submission lifecycle, the Submission Exchange feature actually allows you to exchange document lifecycle information as well. That may you can continue maintaining the documents in your environment, even if their life started somewhere else! Multiple Languages: docuBridge speaks them too! Sometimes it's easier to work in your own language. 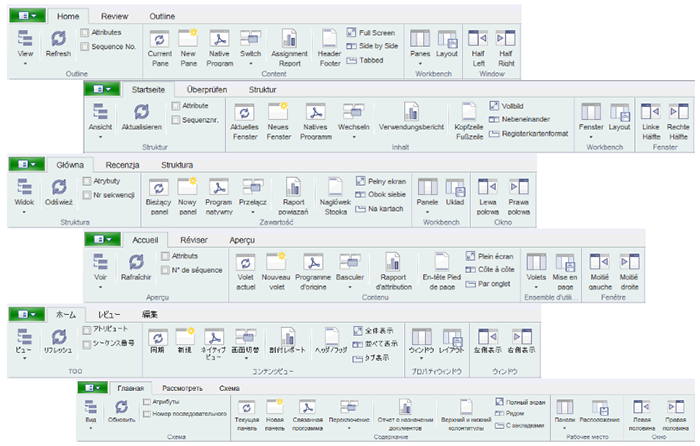 For that reason, docuBridge 5 comes built-in with the following languages: English, French, German, Japanese, Polish and Russian. Users can select their language preferences on-the-fly. Please note that languages may require additional licensing. Paper Publishing: You still need it! We have enhanced some of our paper publishing capabilities, with more options for tab & slip sheets as well as volumization. You do not need to create a separate submission to create a paper version - simply change your output from electronic to print! The new webAccess module enables docuBridge users to review a submission using just a web browser. With webAccess, submissions can be shared for reviewing online within your company or even with external partners. 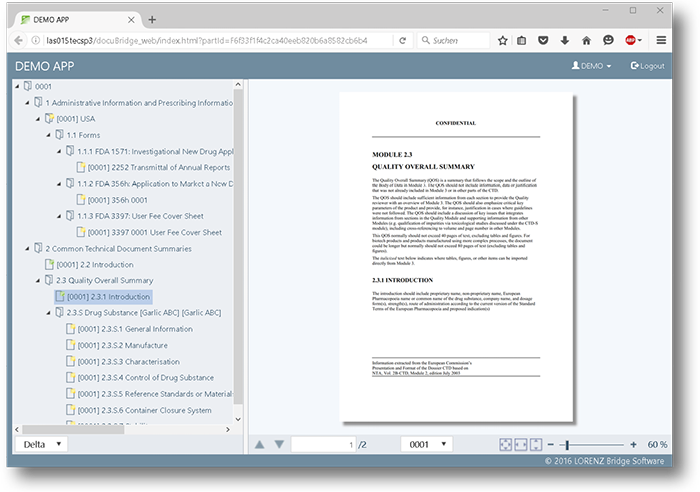 The module allows you to review the pdf content of a submission in current or delta view, to review previous versions in the document life cycle, and to set notes and annotations to public or private.